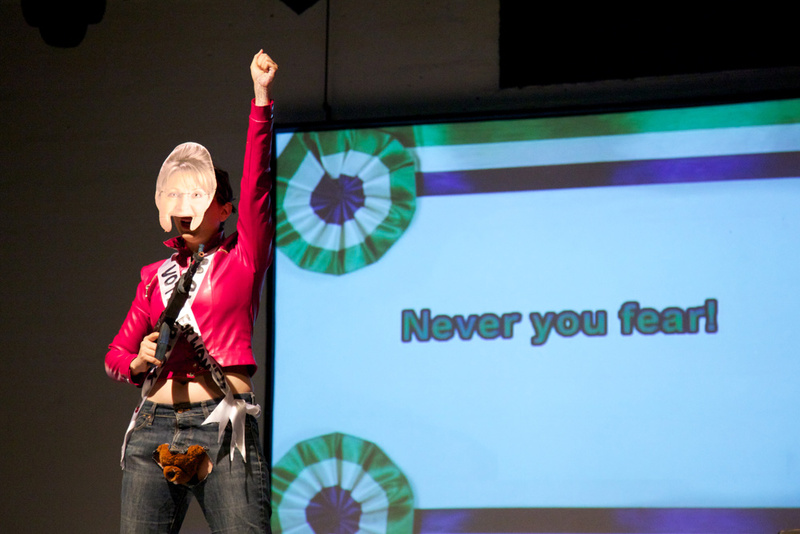 For Bob & Roberta Smith’s event Women Should Be in Charge at the ICA on 20 May 2011, I performed a series of iconic moments from feminist history. 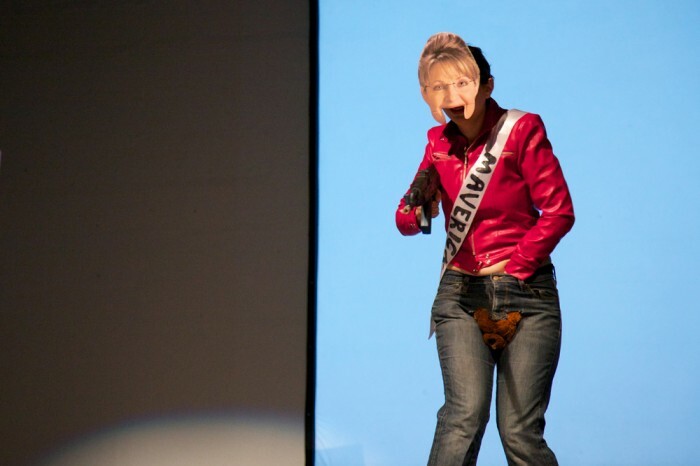 Wearing a Sarah Palin mask and Ms. Alaska sash, I walked on stage in my bikini. I was then asked the following question: “The 21st century will be a century for women, will it be for better or for worse?” I responded by reading the answer off of my arm and was splattered with tomatoes. I run for cover behind a painted reproduction of Velázquez’s Rokeby Venus and burn my bra as a peace offering. Then to feature my talent, I show off my guns and my beaver which has a tampon, a diaphragm and a “Votes For Women” sash hidden inside it. The song “Sister Suffragette” booms out of the speakers and I sing along, prancing around the stage. At the finale I shoot and stab the painting just as the suffragette Mary Richardson did to the original in 1914. The first incarnation of this piece was created for a dinner organised by the Subjectivity and Feminisms Research Group at Chelsea College of Art.